It boggles the mind why Activision, a publisher obsessed with building huge franchises, has refused to help the brand awareness of Singularity. 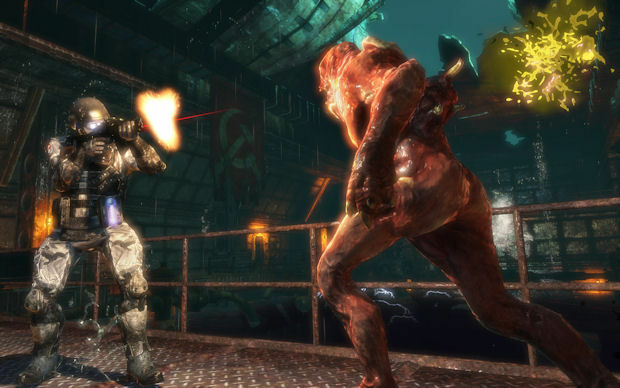 Overshadowed by nearly every other release this year, Raven Software's time-manipulating shooter was released without so much as a squeak, and very few people have talked about it since. This is criminal, as Singularity is probably the best new shooter I've played all year, and is easily one of Raven's finest games. Read on for the full review and find out why Activision is positively insane for sweeping this diamond in the rough under the carpet. To say that Singularity wears its inspiration on its sleeve is to put it very lightly. 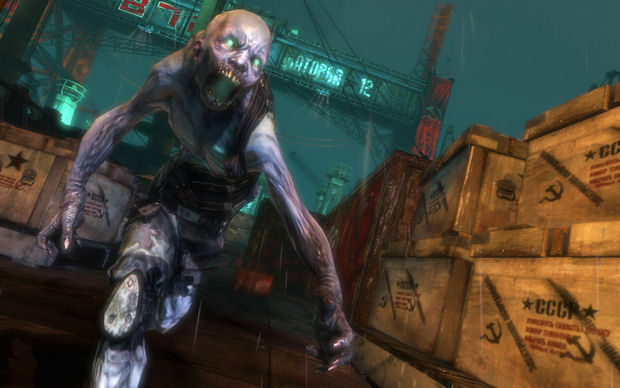 The game is almost shamelessly derivative, taking the both the style and character building of BioShock, the gravity gun from Half-Life 2, and throwing in a few nods to F.E.A.R. However, this mish-mash of other games' ideas is by no means a bad thing. If anything, Singularity manages to almost play as a "best of" collection of FPS trappings, the ultimate compilation of cool gimmicks and toys seen in the genre over the past five years. Set on the mysterious Russian island of Katorga-12, players step into the boots of Nate Renko, a Black Ops soldier investigating the secrets of the "Singularity" event that caused some kind of horrific tragedy back during the Cold War. As it turns out, Communist scientists were experimenting with a dangerous new substance called E99. Renko finds himself on an island fluctuating between time periods, caught between the modern day and 1955, as mutants swarm the island and soldiers wish to take it over. Armed with a powerful weapon, the Time Manipulation Device, Renko must survive the mutated inhabitants and put a stop to those evil Commies, all the while making sure the history remains intact. The story, while not the deepest in the world, is pretty engaging and the whole time travel shtick is handled pretty well. The game has a great narrative style, told in part through tape recordings, propaganda movies and notes left by the island's extinct population. You won't unravel the meaning of life in Singularity, but you will get a solid story that should keep you interested from beginning to end. Of course, the real draw of the game is the sheer volume of toys you can get your hands on. Renko has access to standard weapons such as machine guns, shotguns, and other bland firearms, but once you get your hands on The Seeker, which sends player-steered exploding bullets right into the faces of Russians, or a grenade launcher that shoots glowing, manually-controlled orbs of KABOOM, then everything gets awesome. 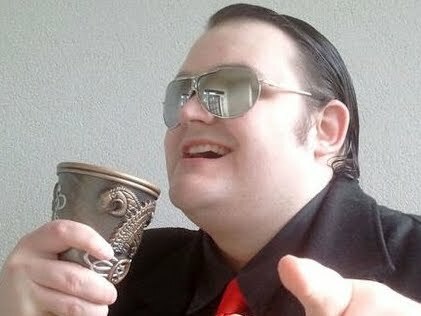 While the game starts out pretty dull, it soon becomes a gratifying cavalcade of over-the-top blood n' guts. All the weapons can be upgraded with suitcases found throughout the game, giving them stronger damage, more bullets, and faster reload speeds. Also, Singularity gets points for having one of the most brutal sniper rifles ever seen in a game. The star of the show is the TMD itself, a glove that Renko discovers early in the game. Its primary function is time manipulation (hence the name) and can be used to repair time-ravaged objects, or rapidly advance their age. Certain staircases can be rebuilt or torn apart at the press of a button, crushed crates can be slid under garage doors and then rebuilt to push them open, and even enemies can be aged within seconds, turning them into rotting skeletons before one's eyes. Some pretty clever little tricks can be performed with the TMD's age-tinkering, and it's just incredibly cool to watch a crumpled staircase get pulled back into action from a rusted heap of metal. The TMD earns a multitude of tricks throughout the game, such as Impulse which generates a close-quarters shockwave, and the ability to generate a sphere within which time stands still. This can be used to stop bullets, slow enemies, or stand inside to heal up and reload. There is also the big Gravity Gun knock-off that draws in objects and shoots them out. You've seen it before, but it's still pretty cool. Oh, and then there's the power to turn enemy soldiers into mutants, which is just quite funny. TMD powers look very much like the Plasmids of BioShock, and this feeling of deja-vu is exacerbated by the ability to use liberally scattered E99 Tech vials to upgrade the glove, as well as discover blueprints that can be turned into useful Perks. 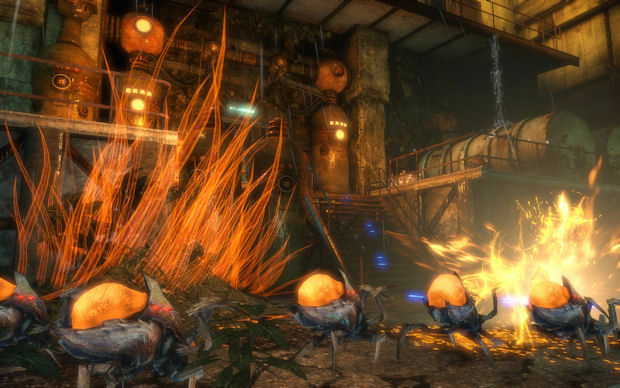 It's almost exactly like the ADAM system of BioShock, sans the little girl murder, and while it's a brazen case of copycatting, it's very good copycatting. The Perks are cool, and players really feel like they're gaining more and more strength as they progress, leading to a game that is very empowering indeed. In truth, by the time the game draws to a close you may feel a tad overpowered, but you'll also feel you earned it. There are a few problems. Sometimes the game isn't very clear about where it wants you go, despite the generally linear corridors making up the levels. For instance, it was only after quite a few minutes of messing about that I figured crumpled crates could be uncrumpled under gates. 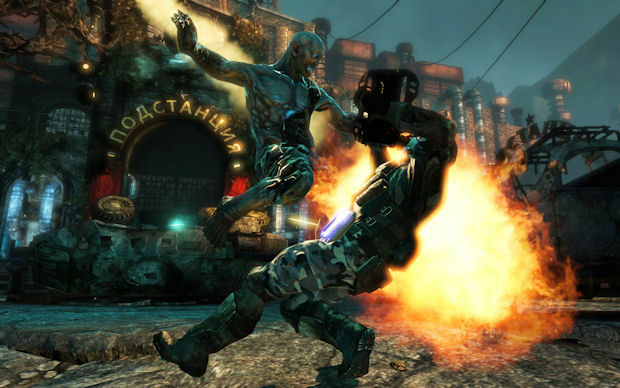 The game also has a problem with enemies being very quiet when moving, allowing them to sneak up behind you and get in some cheap shots. That is to say nothing of the so-called Phase Ticks, an army of little bugs that just run up to you and explode all at once, usually without warning. These are irritating moments throughout the game, but they do little to take away from what is otherwise and overwhelmingly enjoyable experience that should take you about six or so hours to get through. Backing up the campaign, Singularity boasts a multiplayer section that is frankly astonishing in its fun factor. 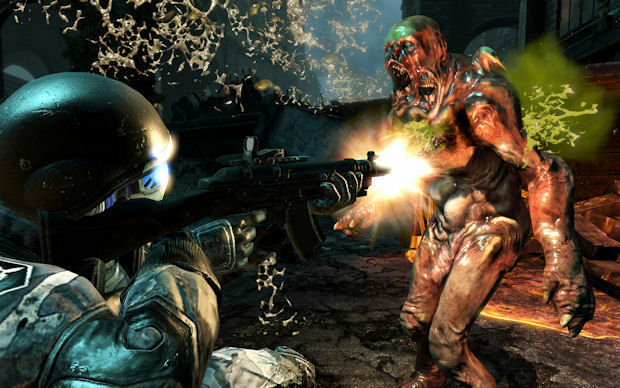 In multiplayer, teams take turns in playing human soldiers and the solo campaign's mutated creatures. Even though the creatures are blatantly overpowered, it doesn't matter because it's just too much of a blast. From miniature parasites that can take over the bodies of enemies to hulking insect-like beasts that shoot explosive lazers, getting to play as the enemies of Singularity is brilliant. As with everything else, it feels like we've seen it in another game (coughLeft4Deadcough) but the originality of the creatures and their various powers shines through, and it helps that the humans also have a variety of neat character classes as well. To be honest, you might not like the multiplayer. It is definitely imbalanced, it's unapologetically silly, and whatever type of match you pick almost always degenerates into mindless chaos as players typically ignore objectives and simply shoot, bite, scratch or puke on each other. You know what though? I love that. In fairness, the fun doesn't have lasting effects and some players may grow bored after a while, but for sheer unbridled nonsense, Singularity most assuredly delivers. At the end of the day, I already had a high opinion of this game based just on the single player. The multiplayer merely pushes it over the edge, acting as the proverbial icing on the cake. Singularity's production values are pretty spectacular given the fact that this is not a AAA game and has was apparently abandoned before it had even launched. The graphics are pretty, the sound is great for its use of atmospheric noise and spooky monster sounds, and the overall artistic design is incredibly strong, with a variety of mutated monsters that are genuinely unpleasant to look at. It has the quality of a top-tier game, the kind that you normally see released in November. Some may disregard Singularity for its lack of surface originality, but those with a less shallow approach to videogames will be rewarded for delving deeper and find a stellar hidden gem. It's true that many of the ideas have been seen in other games, but no title has ever collected the best gimmicks the genre has to offer and wrapped them up in such a tight and slick little package as this. 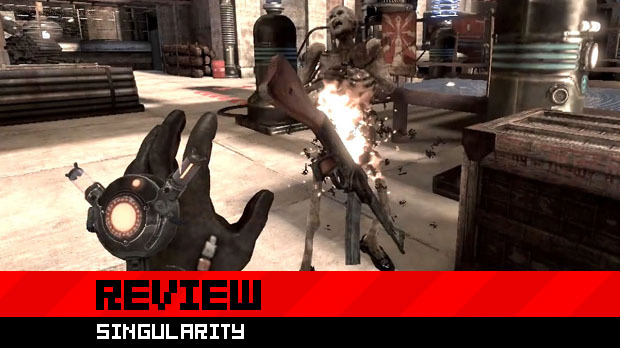 Singularity is a game that manages to feel like its own thing despite being pieced together from previous FPS games, and if you want a great Summer shooter full of violent toys and silly super powers, then you won't get much better than this. Quite possibly the best new FPS of the year so far.